The fifth book in the internationally bestselling Septimus Heap series by Angie Sage, featuring the funny and fantastic adventures of a wizard apprentice and his quest to become an ExtraOrdinary Wizard. In this epic Magykal installment, Septimus ends up on a captivatingly beautiful island, one of seven set in a sparkling sea. He's stranded there with his badly injured dragon, Spit Fyre, along with Jenna and Beetle. There are some strange things about the island, including a Magykal girl named Syrah, a cat-shaped lighthouse that has lost its Light, and an eerie presence that sings to Septimus—can he escape the persistent call? Trouble is also brewing for Lucy and Wolf Boy, who have become entangled with some nefarious sailors at sea, and for Milo Banda, Jenna's father, who is harboring a mysterious treasure chest in his ship's hold. 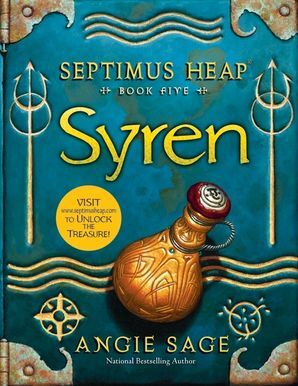 Charismatic storyteller Angie Sage continues Septimus Heap's Magykal journey with more laugh-out-loud adventures, more enchanting charms and spells, and an ever-deepening understanding of the interior life of a young hero.